Supplying flavors and flavor bases for frozen desserts is one of several core capabilities for California Custom Fruits and Flavors. This product line would include flavors and processed fruits for ice cream, sherbet, sorbet, soft serve frozen yogurt, and novelties. Our technical experts are familiar with ice cream manufacturers’ requirements and terminology such as overrun, cost end usage, and standards of identity. In order to obtain evenly distributed flavor throughout an ice cream, flavors and flavor bases are typically added to the ice cream mix with agitation into frozen dairy mix tanks. We supply a full array of flavors, sometimes referred to as background flavors, for this purpose. A wide variety of heat processed fruit purees, all custom formulated, are also available. Regarding vanilla flavors, we supply Category I (pure vanilla extract), Category II (blend of natural & artificial), and Category III (artificial). 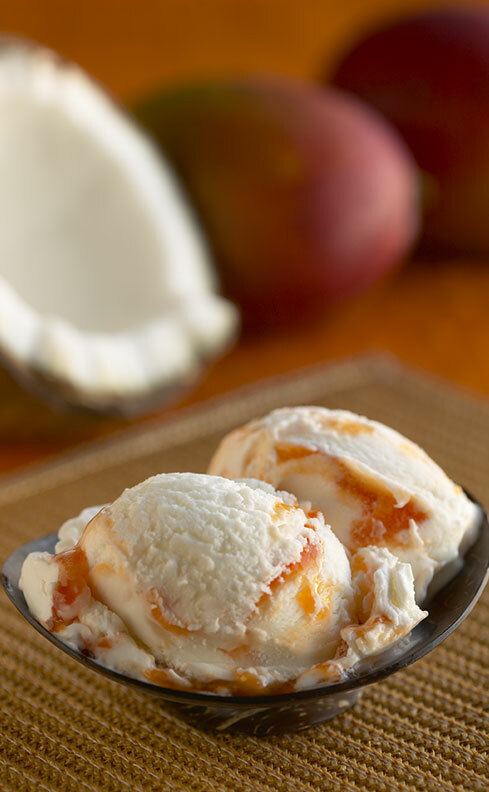 To guarantee optimal food safety, California Custom Fruits and Flavors offers pasteurized berries for ice cream. This type of fruit base is typically known as a Hot Pack or Fruit Feeder and can be formulated from varying choices of fruit piece sizes.These products are specifically formulated to prevent an icy texture when the consumer eats the ice cream. Many ice creams include a variegate, also known as a ribbon or swirl, to add eye appeal and enhanced flavor to the dessert. Our formulas are such that the variegates will perform properly when injected at the dairy and will not taste icy when consumed. We create every fruit variegate imaginable and also non-fruit types, such as caramel and fudge ripple. We supply flavors for novelties, from cost-effective to premium, from sugar sweetened to sugar-free, fruit flavors or non-fruit. Bases for frozen fruit bars, with or without visible fruit pieces, is also a product we supply. In addition to custom formulated ice cream concepts per customer requests, our product development staff proactively offers exciting ice cream concepts on a regular basis. We come up with these innovative concepts by researching market data, trend trekking, and through experimentation in our test kitchen. We look forward to sharing with you our latest ice cream inspiration.